The process of water fluoridation in water plants started to be widely used in the last century. However, after a detailed study of the effect of this element on the human body, it was concluded that it has a negative impact. Many countries nowadays are promoting a need to remove fluoride from the water supply. I don’t want you to wait until your local authority takes care of this. I want you to take responsibility for your health in your own hands. For this reason, in this article, I will explain why it might be dangerous and how to remove fluoride from tap water cheaply and in-home conditions. The scientists’ interest in fluoride reached its peak in the 1930s. This microelement is biologically active when it interacts in the human and animal body. It is a known fact that fluoride has a positive effect on teeth and bones skeleton. For its qualities, fluoride is also an added element in toothpaste to strengthen teeth. The small amount of fluoride has a positive effect on the health of the teeth. Low doses of fluoride help to reduce the development of caries in the deciduous and permanent teeth. For this reason, it was decided to add fluoride to water at the local treatment plan. However, why it went wrong? In the USA, the fluoridation of water began in 1945 at the local plant in Michigan. This was justified by the fight again teeth decay and caries. However, an excessive amount of fluoride in the water supply led to the fact that people started to have health problems. This was because an excessive amount of fluoride in the body leads to skeletal fluorosis, which is essentially damage to the bone structure. The increase of fluoride to 3 mg/l, increases the risk of dental fluorosis, and its concentration to 6 mg/l leads to irritation of bone marrow and dysfunction of a central nervous system. The white spots on teeth characterize fluorosis, and severe fluorosis can lead to brown or even black spots. Fluorosis affects people who live in places with a high concentration of fluoride in their water. Nowadays, city water supply is strictly monitored on the concentration of fluoride. The high amount can usually be found in wells and natural water sources. WHO recommends that the concentration of fluoride in the water shouldn’t exceed 1 mg/l. However, the organization also claims that 2% of Americans are exposed to a level higher than 2 mg/l. You might argue that 2% is nothing but considering the US population that was 325 million in 2017, 2% means that 6.5 million are exposed to a higher dose of fluoride. The fluoride in water has a characteristic chemical smell. Usually, the element gets into the water when insufficient purification or it is present in natural water wells. Now, let’s have a look on tips on how you can remove fluoride from your water supply. 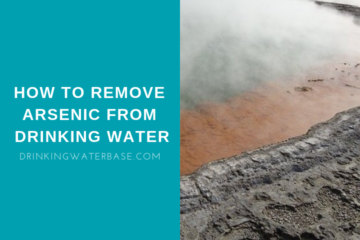 I have mentioned some of these methods in the previous article on how to remove iron from water. This method is applicable when it comes to removing the fluoride as well as iron. The way it works is that the fluoride ions are exchanged and replaced by hydrogen or sodium irons. This is done in the environment that contains these elements: aluminum oxide, activated carbon, and ion exchange resin. The principle is straightforward; you just let the water run through a mixture of powdery materials. The mixture of substances reacts to fluoride ions. These are the following: aluminum and magnesium hydroxides, and tricalcium phosphate. I think there is no need to deeply explain this method, because if you are a regular reader of this website you have probably read about reverse osmosis so many times. There is a membrane with such small pores that only water molecules can pass through. This membrane filters out everything apart from water, even healthy minerals. This is surely an excellent method to remove contaminants from water in general, and this is not relevant only for fluoride. Fill the non-metallic container with water you would like to purify. Make sure to leave the lid open – this is necessary for chlorine to evaporate. Close the lid and leave water for around 8 hours to settle. Now, your water is ready and all impurities settled on the bottom. You shouldn’t use all of the water as all the settled impurities would dissolve in the water again. This method is also excellent for purification. However, boiling doesn’t remove fluoride. Although, it is a good way to kill germs in water. Let the water boil for at least 15 minutes. Salts and chemicals compounds settle, and bacteria die in boiling water. Probably the most efficient way on how to remove fluoride from water is the purification system. There are many various types of a filter, but since we are looking for the cheap ways to treat your water from fluoride, I will have a look on two kinds of filters, pitchers, and faucet mount. The obvious, most common and inexpensive way to remove fluoride and other contaminants are pitcher filters. The jug is divided into two halves with the filter cartridge in the middle. You pour the water in the upper half and let it through the filter to the bottom section. The disadvantage of this type of filtration is the slow water treatment rate and the capacity of filtered water which is between 1-3 liters. I have written the article where I have selected best budget pitcher filters. The faucet filters are slightly more expensive than pitcher filters, but they are solving the problem with the water flow and filter lifetime. The installation is easy and tool-free. These filters fit on most of the standard faucets and have a valve to swap between filtered and unfiltered water. You can have a look on my best picks in this article. In most cases, fluoride won’t cause any damage if its amount is not more than 1.5 mg/l. Usually, the excessive amount of fluoride can be found in water that is supplied by a well and natural sources as this element is naturally present in the ground. The higher amount of this microelement in a body can cause fluorosis of bones and teeth. White spots on teeth can identify this disease. However, please note that white spots on teeth might not necessarily mean that you have fluorosis, and you should always see a doctor that will help you to identify the cause. There are several ways on how to remove fluoride from water such as sedimentation and boiling. However, there are better alternatives that are not expensive as well such as pitcher and faucet mount filters. If you found this article helpful don’t forget to share it with your friends and family on social media. Share your experience with the fluoride in a comment section below. Fascinating – I knew about the fluoride in the water system to fight tooth decay, however I had no idea that higher amounts can cause issues. I also didn’t know that well water could contain higher concentrations of it. I wonder if they actually test for this when they drill a well ? The fluoride that is organically contained in a water is not usually in excess. However, I believe that you can test your source of water and I actually recommend you to do so. Now, when it comes to eating habits, making changes was easier. More fresh fruits and vegetables, no dairy products, less meat. But I kept wondering about water being clean and what to do about it. I mean even though I live in Canada where even tap water is supposed to be clean enough compared to other countries, I still think there’s a way to drink more pure H2O. I’m doubting between pitchers and faucet mount filters. Because filters would be great when I travel, but faucets great for home. Out of curiosity, are faucet mount filters easy to install? Appreciate you sharing your knowledge. Yes most of the faucet filters are super easy to mount. They will fit most of standard faucets so, just check your faucet if it doesn’t have any unusual shape. I agree with you that most of the people don’t realize that they are made of water, therefore it plays a massive role in ones health. So, I would encourage anyone to take care of it. I honestly believe that initial investment in the right water filter can save you much in the long term. It is not just about fluoride. Check out my other articles on the website, I believe I have enough information so you can make an informed decision. I’m so confused about if fluoride is or is not good for us. My daughter’s dentist insists that I should let her drink water with fluoride in it because it will help her teeth while others, including your report, say that it isn’t good for us. For now, I’m sticking to fluoride-free products which seem to be working fine. Now I’m glad to know how to remove it from our water. In short, fluoride is good for us but in a certain amount. When you exceed this amount it becomes dangerous as per the article. I am not going to argue with your dentist as I am not a doctor, but personally, I would just buy a fluoride toothpaste if more of it is needed. It is a concern for peoples health where the fluoride level is over 1.5mg. At home we use a Brita pitcher filter and its main purpose is to remove the hardness from the water, as we live in an area of the UK with harder water. I have drank the filtered water from it before, but found it quite a bit tangy. Its good that there are a few cheap ways in removing the fluoride from the water. It was interesting to read some of the history of fluoride. Unfortunately, Brita pitcher cannot remove the hardness from water. Check out my other article about hard water and how to deal with it. I live in the country and on a farm. All of our water comes from the heavens and it is beautiful to drink. We have never had fluoride in our water and at 71 years with all my teeth still in good shape I would ask whether it really is necessary to put it in in the first place. For people living in cities this article would be significant especially if they suspect their water supply has higher ratios of fluoride. You have listed several ways to reduce the amount of fluoride. A simpler way would be to collect your own fresh water with a tank or move to the countryside. My other concern would be if authorities can force you to have fluoride in your water what else might they put in there? Well, the story with fluoride is that you have enough of it from food. Also, if you use a fluoride tooth paste you cover the amount you need. So, for this reason I don’t understand the point of adding it there. Well, Eugen, this has certainly been an eye opener. I have been drinking water directly from the tap all my life. And, now, I find out that the fluoride in my drinking water can have a traumatic health impact on my body! I like the Brita pitcher filters much more than the faucet mounted ones so, I think I will give them a try. The problem is, that they don’t filter as much water – but, I can get used to it. Are you planning to review any gravity fed water purification systems? I would be interested in your assessment of them as compared to the pitcher and faucet filters. Thanks for stopping by. Yes I am planning to make an article about gravity fed systems soon. I actually just recently discovered that the fluoride in my water is causing a ton of my houseplants to basically turn yellow and brown at the end of their leaves! I had no idea this was the cause until someone randomly pointed it out. Because of this I’m now using a countertop filter just like you mention below. Is there any easy way to tell how much Fluoride my water has? A simple test or something I can do? Actually there are tests to detect Fluoride in water. However, these will tell you whether it is in water or not, but not the amount. There are more advanced testers available but we are talking hundreds here, so the question is… Is it worth the price? Excellent article, I enjoyed very much the reading! I have heard somewhere that fluoride is really bad for the health and here again I read it. Very informative, thank you! I never drink tap water. In fact, I use tap water only for my coffee. I do have a question though. Do the tap water still contain fluoride after boiling it? Yes as mentioned in the article unfortunately, boiling does not remove fluoride out of water. It is not that it’s explicitly bad, but It is not something you need to have in water as I believe with balanced diet we have enough of it from elsewhere. Interesting I always thought the fluoride in water was good for us, thanks to reading your article I have now found out that this is not exactly the case. I love spring water and use it regularly and now am wondering if this source that I collect it from has higher levels of fluoride than recommended. I do feel it would be best to have this water tested now that I am aware of this fact and will cease drinking until I have the information. I am glad that my article has helped you and educated you about the issue. I would definitely suggest to test water to anyone. Great article about fluoride removal from water. I have seen numerous people suffering excessive fluoride ion from impure water and skeletal fluorosis in small kids and huge amount of people are impacted by having brittle teeth. It is rampant in the developing countries. Good news is people are slowly getting aware of these kinds of situation. Lot of people really don’t understand English, these ones are suffering more as I have felt. I was removing ionic fluoride from a pharmaceutical intermediate as a part of assignment. It was not easy to meet the tight specification at ppm level. I wish a lot of exposure for this article. Thank you for sharing. Thanks for all your support. I think that it is pointless adding fluoride into water, I mean we should have a choice whether we consume it or not. If there is a need to get more fluoride you can get a toothpaste with higher amount of it.